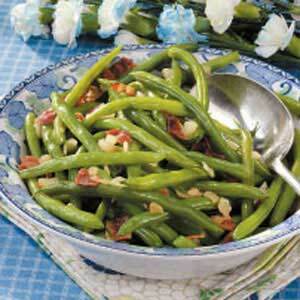 Bits of bacon and onion dress up the green beans in this easy-to-prepare side dish. In a large skillet, cook bacon and onion over medium heat until bacon is crisp and onion is tender. Meanwhile, place beans in a large saucepan and cover with water. Bring to a boil. Cook, uncovered, for 8-10 minutes or until crisp-tender; drain well. Add to bacon mixture. Sprinkle with salt and pepper; toss to coat. Yield: 8 servings.